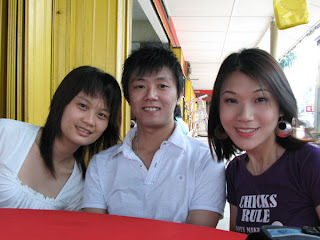 The next day, we stopped by Mutiara Seafood for lunch before heading back to KL. rif and I have been frequenting Mutiara Seafood whenever we are in PD which is once or twice a year. The food here is nicer (and more reasonable) than a lot of restaurants in PD. 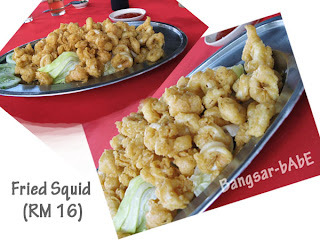 We ordered the deep fried squid, kangkung belacan, black pepper ostrich, lemon chicken and sizzling tofu (all large). The squid tasted pretty average. The batter was not as light and crispy as I wanted it to be and the squid was slightly on the chewy side. But all in, it was still decent. 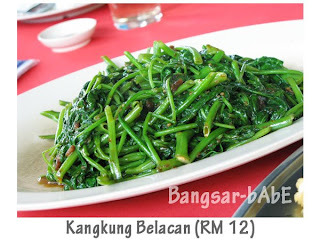 The kangkung belacan was ok, with the right balance of chili and belacan. How difficult can cooking this dish be? 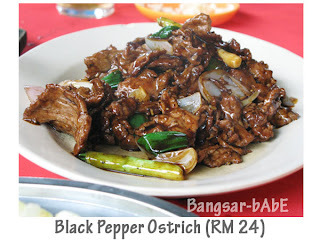 The black pepper ostrich was not bad; the meat was well marinated and tender. Cooked with bell peppers, spring onions and onions, the sauce had just the right amount of black pepper which did not overpower the overall flavour of the dish. The lemon chicken was mediocre, I’ve had better ones. I didn’t quite like the batter as it was too thick and the lemon sauce tasted very watered down. 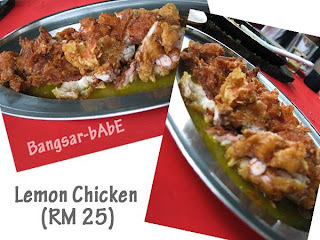 There was a lack of tang, which is vital when eating lemon chicken. 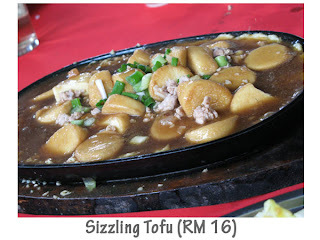 The sizzling tofu was quite standard. Not bad but nothing spectacular either. Japanese beancurd in brown gravy and topped with minced pork and spring onions, it tasted great with white rice. 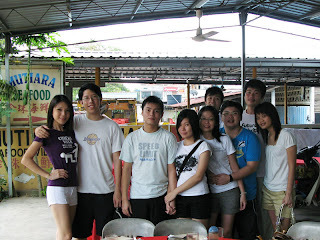 We ended the meal with an ice cream potong each which costed RM 2 per stick (I find that expensive). All in, the bill came up to RM 126 for the 9 of us. Pretty reasonable for a decent meal. Verdict: If you happen to be in PD, stop by this place for decent, reasonable food. Other restaurants tend to hike up the price, especially if they know you’re not local. wah!!! How come Yibin is accompanied by 2 girls!! When I took out the camera he was ready to be in the pic! This guy really cam-whore pro!